With the satellite being rolled out to the launch pad and positioned in the launch tower, it’s been a very exciting weekend. Last Friday, with the Rockot upper composite all finished, it was moved from the 101B cleanroom to the General Hall ready for rollout on Saturday. 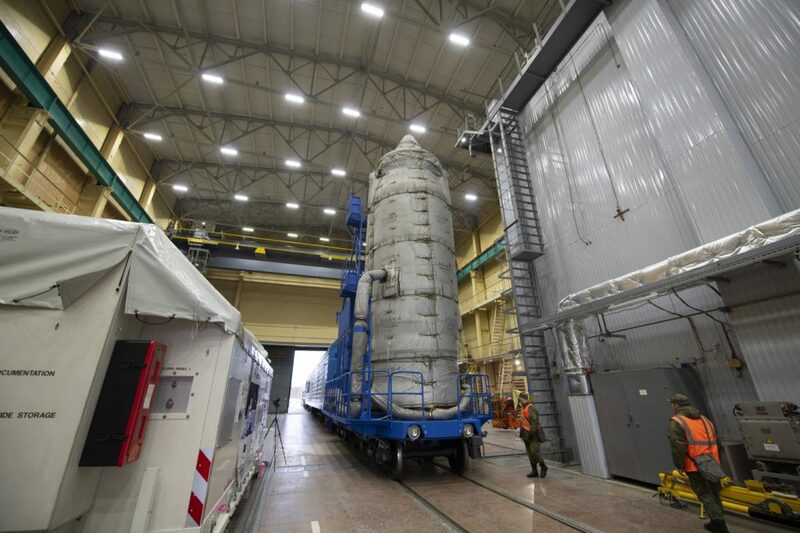 The Khrunichev teams continued their preparation activities such as electrical checks. Just before we left the site that evening we saw that the upper composite had been covered to keep it warm for its journey to the launch pad and that it was ready to be loaded on the train. Some of our team members went out to the launch pad to make sure everything is okay in the ‘under-table room’. Cameras were also installed so that we can keep a check on the room remotely. And, since some of the cleanroom equipment is now no longer needed, we’ve started packing up a bit. We were also kept busy preparing for the launch countdown procedure which involves ESA, Thales Alenia Space, KSRC, the military and Eurockot. We all now know what everyone’s role is on the big day. The full countdown dress rehearsal takes place on Monday. On Saturday we arrived at the MIK at 05:30 in time to see the Sentinel-3B upper composite roll out. Following a briefing by the military, the train left at 06:00 sharp. It started by reversing out of the MIK very slowly and then manoeuvred to the right track, and continued at the same slow pace towards the pad, with armed soldiers onboard, watching. The rail convoy arrived at the pad in front of the launch tower a bit before 09:00. We could see the upper composite being lifted up to level 7 of the tower where it was prepared to be mated with the lower stage of the rocket. After that, the doors of the launch tower closed and the subsequent activities were not for us to see, but we were all very happy and impressed by what we could already attend. 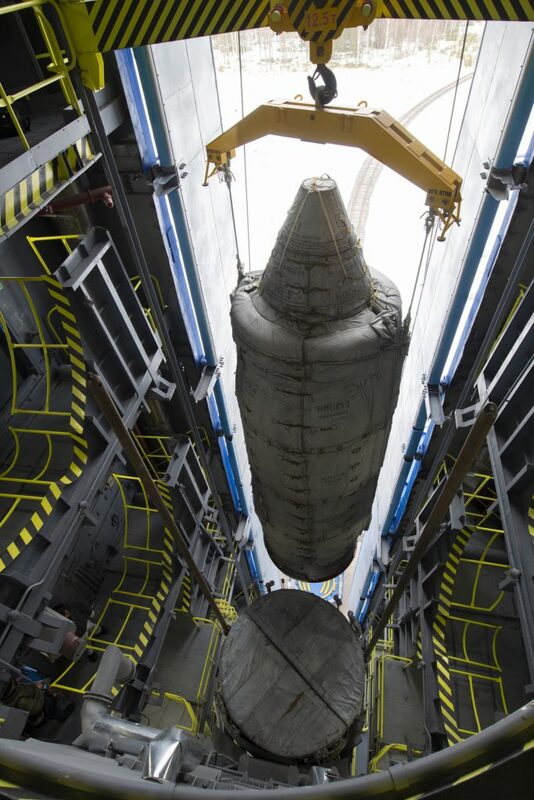 KSRC proceeded with their activities at the launch pad, transit lines electrical check-out, mating of upper composite to the booster unit, removal of thermal protection, connection of the ground cable network. 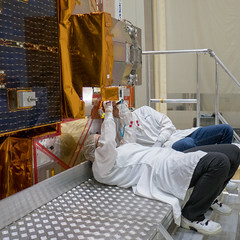 All went smoothly and the Thales Alenia Space electrical team got their slot for electrical check-out and switch ON of the satellite in the middle of the afternoon. All the verifications were successful. So by the end of Saturday, everything at the launch pad had been fully assembled. Inside the launch tower, within the fairing, on top of the Breeze that sits on the booster unit, Sentinel-3B sleeps quietly, awaiting to be waken-up on Monday for a first launch dress rehearsal. Liftoff is still set for 25 April at 17:57 GMT (19:57 CEST). Good luck Sentinel-3B! We’ll be following the last preparations and the launch from Darmstadt!